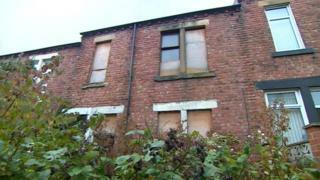 A council in a region with the highest proportion of long-term empty homes in England is spending thousands of pounds refurbishing derelict properties. More than 16,000 homes in the North East have been empty for longer than six months. Developers can apply for council grants of up to £10,000 on condition they subsequently find tenants. Property developer Manish Duggal said the fear of losing money "keeps you going". "It is helping to make sure that the property isn't staying empty for a long period of time because, if it's empty for more than three months, I'm going to lose £10,000," he said. "It's quite a lot of money. "It keeps you going and makes sure that you're doing all you can to get the property occupied." Mr Duggal is renovating two flats which have been empty since 2004 and were sold after council enforcement action. Edward McGee, who lives next door, said their condition had prevented him selling his own house. "They came and looked at it - and they looked at that next door and they didn't want to know," he said. "It's an eyesore. Complete eyesore. "I just hope the guys put it right." The council has awarded £675,000 to bring 185 homes back into use since its grant scheme started five years ago. Colin White from the authority said landlords had contributed about £2.7m. Housing crisis: Why not use empty properties?